For thousands of centuries, fur has been a material that has stood the test of time. From “contagious magic”, to a way to keep warm, to a fashion statement, to a way to show your economic status, fur has been used in a variety of ways throughout history. This blog post will explore the history behind fur from ancient Egypt to present day controversies, as well as why animal fur was seen so powerful to some. Fur was once believed to have “contagious magic”. What does this mean? 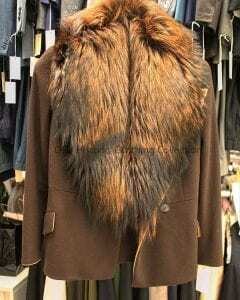 Well, hunters in early history used to believe that wearing the fur pelt or skin of a certain animal would give them a special connection to that animal. The early hunters truly believed this quote about animal pelts. If they were to wear the fur of a cheetah, perhaps they would gain the speed and intelligence of the cheetah. It would guide them on their journey through life. As centuries rolled on, fur received a new type of praise. Instead of containing magical powers, fur was now seen as a determinate of your social status. In ancient Egypt, only kings and high priests were allowed to wear the fur like ermine, mink, or chinchilla. High priests would wear them during ceremonial events showing the importance of fur. Entering the 11th centuries, nobles and the rich loved to adorn themselves in the finest furs as well. After lower class husbands began to place mortgages on their homes in order to give their wives fur, the upper class was eager to place laws stating people of the lower class were prohibited to buy the best furs like ermine or vair. They wanted to be distinct from the lower class. However, they did allow the unprivileged the right to wear fox, otter, and the fur of small rodents. Beginning in the 1500s, the fur trade sprang into action. It was most popular in North America and started with the trade between the Indians and Europeans. Beaver fur quickly became the most valued item on the list. In Europe, they would used it to make felt hats. However, in the 1800s,the number of fur-bearing animals began to dangerously decline due to the high demand for fur. By the end of the 1800s, the fur trade slowed as silk became the larger demand. 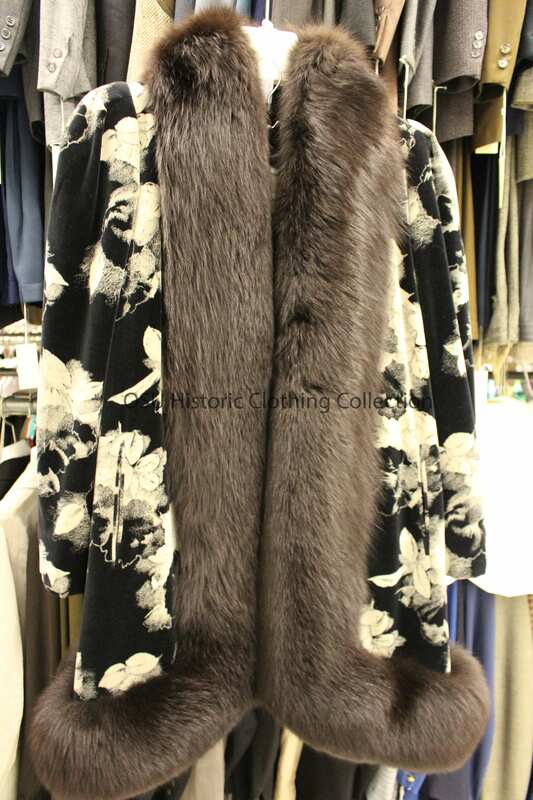 With an increase in technology entering the 19th century, furs were able to be produced at a faster rate. It brought easier ways to create shinier, silkier furs. One woman, Yelena Yelmark, even found a way to create a leopard skin pattern, which would become highly desirable. Even though furs became lighter, easier to make, and more advanced, they were still made for the wealthy. So, in response to the less wealthy, manufacturers developed coats and dresses merely trimmed with fur in order to make it more affordable for the lower class. They used fur from animals such as raccoons, muskrats, wolves, hare, and more. 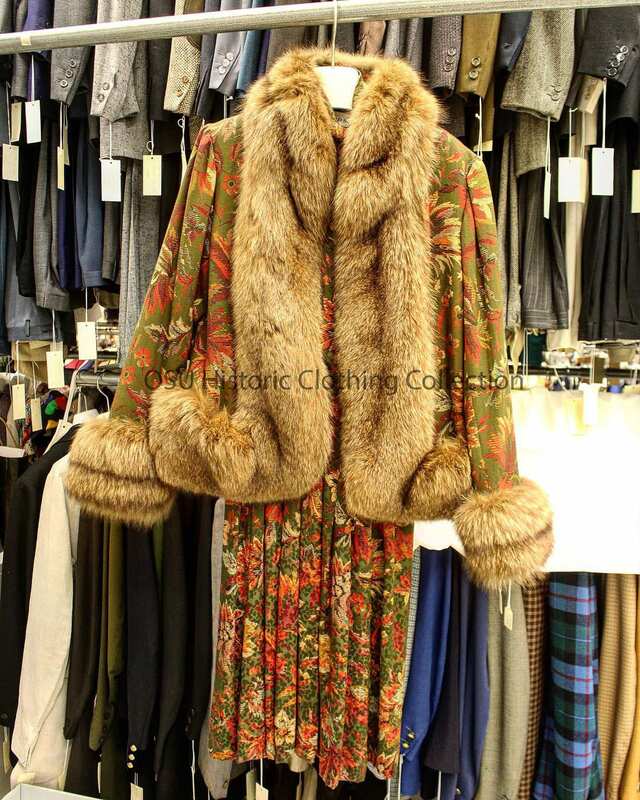 Entering the 1950s,the production of fur coats was at its peak. There was a variety of fur available. The priciest type on the market was made of mink. The full coat made of the best mink could cost up to $600. Prices varied from fur to fur, however. Red fox was always less expensive than the highly desired silver fox. The above quote above shows the pressure that society put on women. Self-worth depended on the price tag your fur coat entailed. 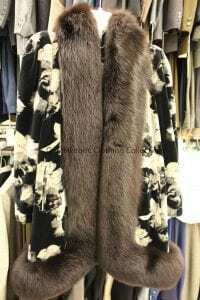 It also shows the popularity of fur in the 20th century. However, the idea of spending tremendous amounts of money for a coat didn’t appeal to everyone. Some companies began to produce faux fur at the beginning of the 20th century. They made it using pile fabric, more popularly used to make corduroy velvet. After a tax was put on furs during war time, the nation went crazy for faux fur. Demand increased so much that some companies had to shut down temporarily. Arnold Scassi: Olive and Rust Feather Flower print jacquard print dress and challis with a fur trimmed jacket. Fun Fact: Arnold Scassi’s father was a furrier. By the mid 1960’s, it became more than just a cheaper alternative to real animal fur. Members of the Audubon Society began to protest the use of endangered species. By the 1970s, popular celebrities joined in the movement. Mary Tyler Moore, Doris Day, and Angie Dickenson all spoke for the New York Times. Versace, 1997: Brown Wool suit jacket with removable fur collar. In more recent years, top brands such as Versace, Gucci, Givenchy, and Michael Kors have all removed themselves from the realm of real fur. Despite the fight against fur, there was also a downside perspective towards faux fur. It was made with petroleum, which was taken from natural resources. Many feared and argued that the use of petroleum would cause an increase in pollution. Fur was once seen as way of gaining “contagious magic”. Hunters in early history truly believed you could gain strength and guidance from wearing the fur of animals. However, perhaps the same idea was slightly twisted when we entered Ancient Egypt and early Europe and North America. Fur still gave you power, but this time the power looked like high social status. With money came the best furs, and the best furs gave you social status. In the 1930s, people believed that the fur you wore told the whole world what type of person you were and what type of life you lead. However, by the mid 1960s, the idea was morphing once again. Fur became wrong in the eyes of many. Wearing real fur was frowned upon by many including celebrities like Doris Day and Mary Tyler Moore. This topic has become more of a political statement in the past 40-50 years. Who knew that fashion would cause such controversy? Posted in Uncategorized	Bookmark the permalink. I highly recommend watching the documentary Angry Inuk regarding the controversy over native people continuing to hunt seals. It’s a very eye-opening perspective, particularly for those who may consider themselves animal rights activists. We appreciate your correction and have revised the text!